With Coburg’s VFL season coming to a close as it faced a bye this past weekend, an array of Lions were available and selected to play for their local clubs. Starting with the Essendon District Football League (EDFL), duo Jay O’Donoghue and Tyson Lever represented Glenroy in their 39-point loss to Maribyrnong Park. Both were named among the best on ground. While O’Donoghue booted two majors, it wasn’t enough for Glenroy to finish off their first season back in Premier Division on a high. Jesse Corigliano made an appearance for Strathmore, going up against Aberfeldie. The Mores were unable to seal the win however, defeated by 28 points. Brad Bernacki and East Sunbury were a lot luckier however, leading from start to finish to record a 50-point victory over Coburg Districts as they sealed their first finals appearance since entering the competition. Moving to the Northern Football League, Aidan Tilley and Mark Kovacevic paired up for West Preston-Lakeside, defeating Greensborough by nine goals to seal second place on the ladder. Both players contributed to the scoreboard, Kovacevic with two and Tilley with one, with Tilley also named among the best on the day. Another duo in Josh Iacobaccio and Daman Aujla featured in Bundoora’s 11-point defeat over North Heidelberg; the Bulls were kept goal-less in the first but managed to take the lead in the third term. Aujla was rewarded for his efforts and named best on ground as the Bulls stitched up 4th place. Marcus Lentini represented his junior club Diamond Creek in a nail-biting two point win over a fiery Thomastown, however it was not enough for finals. Over in the Eastern Football League, Adam Swierzbiolek and Jack Sandric played for East Ringwood in their clash with Rowville. The visitors were too strong however, defeating East Ringwood by 41 points. Swierzbiolek managed one goal. In North Ringwood’s match against Norwood, it was Lion against Lions as Harry Nolan faced Lochie Dickson and Alex Mioni. The game was tied at 83 a piece, with Nolan named one of North Ringwood’s better players. Mioni managed one goal for Norwood. In the Southern Football Netball League, Josh Fox was on fire for Cheltenham, booting five goals against St Kilda City. It wasn’t enough however, going down by 49 points. Fox was also named the best on ground. Max Mitchell-Russell and Port Melbourne Colts had a day they probably won’t want to remember, defeated by East Malvern by 88 points. Inaccuracy plagued the Colts, kicking just 2.10. Mitchell-Russell was one of Port’s goal-kickers. Over in the Western Region Football League, vice-captain Nick Mellington made an appearance for Caroline Springs against Sunshine. He was named among the best despite the 28-point loss. The Ballarat Football League saw pair Mitch Conn and Josh Guthrie represent Sunbury in their 42-point victory over Lake Wendouree. Guthrie managed two goals in the win. Lachlan Watkins and Melton South couldn’t get the job done over Sebastopol, defeated by 87 points. Watkins booted one major. In the Goulburn Valley Football League, Jack Murphy and Seymour were unlucky in their match against Tatura, going down by just seven points. 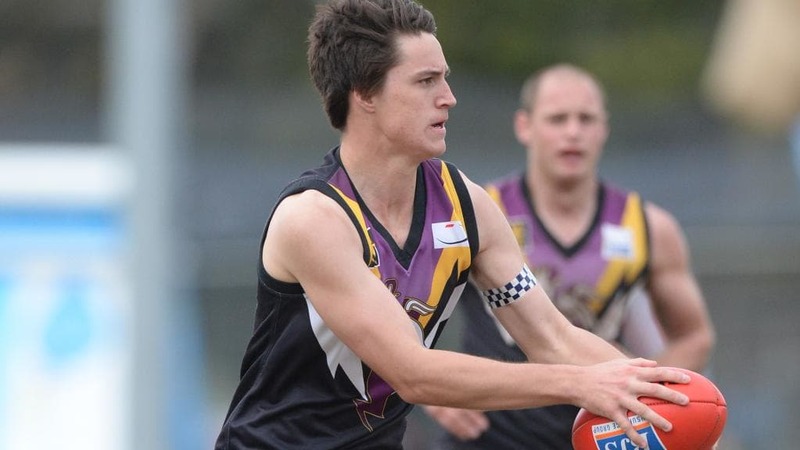 To wrap things up in the Victorian Amateur Football Association (VAFA), Billy Kanakis and St Kevins had a big 83-point win over Old Melburnians. Kanakis booted six goals for his side and was named among the best. Thankyou to all of our members and supporters, for your passion and encouragement throughout the 2018 season. We hope to see you at our Jim Sullivan Best and Fairest Count on Friday September 14. For more information please head to our website or contact us via email at info@coburgfc.com.au.